(NaturalNews) Have you ever felt sick after flying, only to assume it’s jetlag or a virus you picked up from another passenger? Well, think again! You might have been exposed to an insecticide, pesticides or other toxic chemicals – deliberately used by airline staff. I think airline passengers should be outraged to know that poisonous chemicals are now being sprayed on planes regularly – DURING the flight, while travelers are inside the plane, This is true – the United States government is actually pushing this agenda of poisoning passengers. You can’t make this stuff up: Check out this disturbing video – does this look right to you? Reminds me of Nazi Germany: Are airplane cabins safe or a gas chamber? This process is being referred to as “disinsection,” a word that seems to have been made up by the TSA or airline industry. Disinsection, or the spraying of an insecticide or pesticides on planes, is now permitted under international law. The Department of Transportation says that the supposed intent is to protect public health, crops and agriculture, and the environment. The International Civil Aviation Organization and World Health Organization (WHO) admit that aircraft cabins are being sprayed with what they are calling a “fast-acting insecticide” with passengers on board, right before takeoff. Some airlines are instead treating aircraft interiors with a “residual-insecticide aerosol” right before passengers get on board. This is truly sickening behavior: These toxic chemicals are also being applied directly to the aircraft’s internal surfaces and, to make matters worse, passengers get to breathe in this crap into their lungs. The spraying of toxic chemicals like pesticides or an insecticide inside an enclosed, pressurized airplane cabin is beyond alarming. It is an assault on the senses and nervous systems of the passengers of the plane. Those with a pre-existing health condition or compromised immune system are even more at risk for suffering unwanted health effects. However, all passengers exposed to these toxic chemicals “agree” to the conditions, even if they aren’t aware of it. The fact that spraying will occur on a flight is stated in the fine print when the airline tickets are purchased. 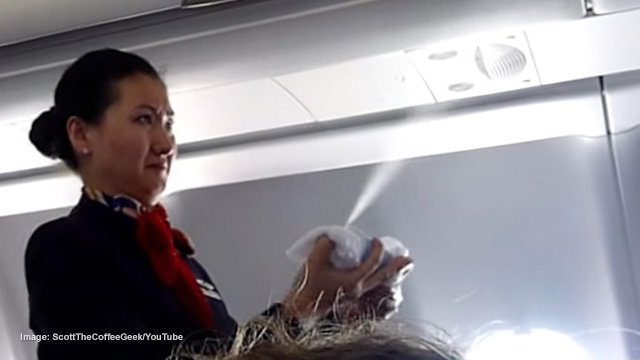 Passengers implicitly agree to being sprayed just by buying a ticket for a flight where these practices will take place. Many airline passengers are already reporting negative health effects from exposure to toxic chemicals on flights. For example, flu-like symptoms, sinus issues, rash/hives, headaches and swollen joints are just some of the horrible effects. However, far more serious issues like acute respiratory problems and anaphylactic shock have occurred. Chronic issues affecting the neurological and immune systems have also been reported. The most common aircraft pesticides used on airplanes are synthetic pyrethroids, specifically permethrin and d-phenothrin. Remember, they kill insects by attacking their nervous systems. Not surprising, at this time, the World Health Organization is downplaying the symptoms and concerns voiced by passengers. They state “there’s no evidence” that these insecticide sprays cause risk to human health, and that the sprays are safe. The arrogance of these statements is appalling. Even a layperson knows not to use chemical sprays in an area that is not ventilated. In the short term, the only recourse is to avoid flights where this practice takes place. However, airlines should be strongly petitioned to find non-toxic methods of dealing with pests. With the plethora of foreclosures that has raddled the core of this country, I find it highly questionable that companies openly advertise that they will Help you to strategically build a chain of title. Can we say DOCX? Lender Process services, Prommis Solutions? As a leading post-closing services provider, we partner with you to strategically build a complete trailing document process that’s right for you. Resource and Training Challenges Due to Volume Influx Eliminated – we adjust with the market so you don’t have to. Complete System Integration and/or Web-based Hosting of Document Status and Images – we will update your system and image repository or if you don’t have a system – we will be the system of record for you. Flexible Audit, Document Requirements and Deadlines tabled by Investor, Custodian and/or Internal Guidelines – we understand that one size does not fit all when it comes to document types, audit reviews and delivery deadlines. Life of Loan Enabled Services (1) Servicing Data Validation (2) MERS Updates (2) Assignments and/or (3) Lien Releases – we will offer discounts on same order processing; when needed. Effective Document Chasing Processes Escalated In Accordance with Investor Specific Deadlines – we will minimize investor imposed penalties as well as document related buybacks. Closing Agent and/or Correspondent Score carding – we provide the data to score performance; delivery ratios and error percentages to manage the relationships you rely on. You can count on Nationwide Title Clearing, Inc. for thorough and timely follow-up and tracking on all your outstanding original documents.